I, easily, fall victim to the bounty of fruits and vegetables that flood the supermarket this time of year; sometimes, to the point of detriment. In that I’ll be so overwhelmed with all of the delicious, fresh offerings that I’ll buy a few too many tomatoes or an extra pound of peaches and then scramble for ways to use them as I notice them starting to go soft a week or two later. I always find something to do with them, but sometimes it makes for some mismatched meals. Luckily, I always know what to do when I have berries on their way South, which is exactly the situation I found myself in this week after I had stocked up on some good strawberry and blueberry sales a week or so prior. I’d already eaten many of them on their own, dotted on top of cereal, blended into smoothies (some of which were actually milkshakes that I called “smoothies,” shhh! ), and even in a balsamic vinaigrette I’d made poured over grilled chicken atop salad. Delicious! When I happened on their overripe siblings yesterday while searching for a snack, I knew I wanted to use them in a sweeter application, but also something that could handle and disguise the fact that they were past their prime. Muffins? 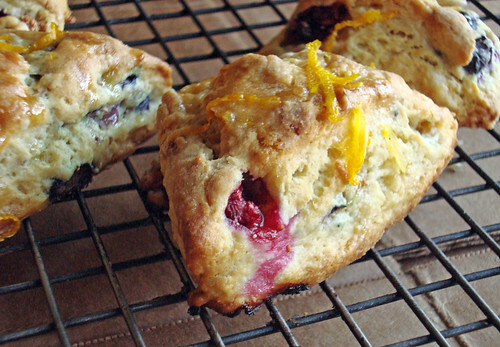 Sure, muffins are delicious, but why make muffins when you can have their sophisticated cousin, scones? Have you properly met? 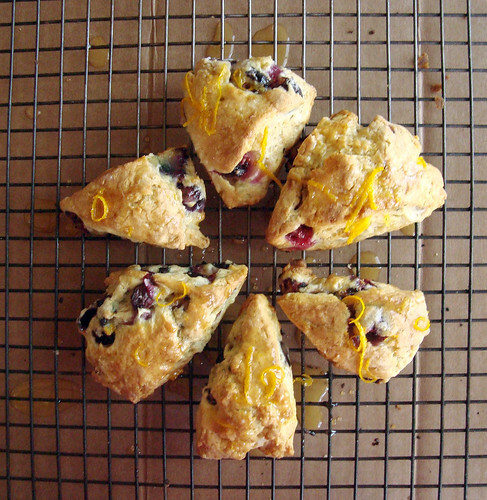 Scones are simple to execute, but sound and look special, maybe even snooty! Undoubtedly this is because of their being good, proper teatime fare. Scones, though, prove themselves worthy of the fuss. They have a much dryer crumb than the muffin, but in their airiness, they are also deliciously buttery and light all at once. With blueberries and strawberries folded in, they make for a slightly sweet breakfast treat on their own or accompanied with butter and jam for spreading. Better yet, spoon on some clotted cream and lose sense of everything else happening around you. True story: Bear thought I should make clotted cream to accompany this post. Like it was NBD. Like I should just get to it after I churn some fresh butter or something. Anyway, these scones are delightful in their simplicity as is, but bumped up with the addition of a quick glaze of orange and cardamom that adds a different kind of sweetness and a bit of spice. When it hits the hot scones, the glaze gives off a wonderful scent of citrus with warm notes similar to ginger and cinnamon. The glaze is the perfect compliment to the roasted berry flavor and, because they’re a sturdier crumb, the scones hold up to the glaze well. This is a pairing of flavors I think I’ll come back to again and again. Combine the flour, sugar, baking powder, baking soda, and salt in a bowl. Cut the cold butter into small cubes and then mix it into the dry ingredients with a pastry cutter or a fork. When finished, the mixture should resemble coarse crumbs. In a separate bowl, beat the egg and stir in the sour cream and vanilla. Fold the wet ingredients into the flour and butter mixture gently until just incorporated; if a bit of dry crumb remains on the bottom, that’s fine, you just don’t want to over-mix. Dump the ingredients onto a lightly floured surface and pat the dough into a rough rectangle. Sprinkle the berries (I used blueberries and strawberries; with the latter, you’ll want to dry them a bit with a paper towel after dicing and before integrating them into the dough) in an even layer onto the dough and then fold it over onto itself. Repeat this process once more or until all berries are incorporated throughout the dough. Shape the dough into a disk, wrap in wax paper or plastic wrap and refrigerate for at least 1 hour. While the dough is refrigerating, make the glaze by combining the above ingredients and set aside. When you are ready to roll out the scones, preheat the oven to 400°F and transfer the disk of dough onto a lightly floured surface. Cut the disk into 8 wedges with a sharp knife or pizza cutter and assemble the wedges on a baking sheet lined with a silpat or parchment paper. Leave a few inches of space between wedges, as they will grow in size as they bake. 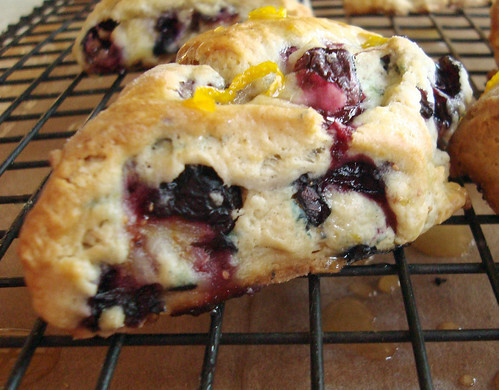 Bake the scones for 18-20 minutes or until lightly browned. After 5 minutes, transfer to a baking rack to cool. If planning to serve that day, drizzle glaze over warm scones and enjoy. If not, store the cooled stones in the refrigerator. When ready to serve, warm them and apply glaze before eating.